My Crafty Little Moments: A New Week and Baking to be done! A few more hexagons crocheted, I have to keep my momentum going, I'm just waiting for a few more balls of Rowan Handknit cotton to be delivered today. I have visitors this week, my daughter is stopping over with my grandson whilst she has new floorboards in her bedrooms, so lots of chatting and tea drinking going on here! 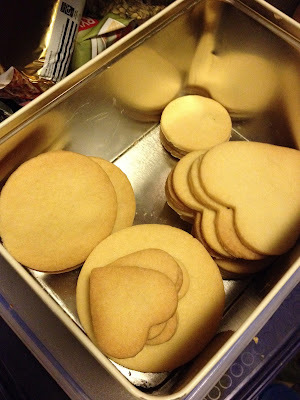 So out come the homemade shortbread biscuits and on go the inches on the hips. I just love baking but the cakes, biscuits and goodies never seem to stop long in the pantry before I am needing to do more baking for my little ones and not so little ones. Set your oven to 150c mine is a fan oven so higher if yours is not. Grease a baking sheet ready to go. Mix the butter and caster sugar together until nearly white and fluffy, then mix in the flour until it forms a dough then the going is easy and fun, choose your cutters and roll out the dough on a floured surface and cut away to your hearts desire. Bake for about 15 minutes I like mine to have a pale colour rather than be too coloured. When cooled (I just leave on the baking sheet) either leave them, sprinkle with caster sugar of get the children to drizzle some icing and decorate. Well the beef stew in now in the oven for this evenings dinner and I am going to make some lovely homemade bread to go with it and then back to restocking my cakes. 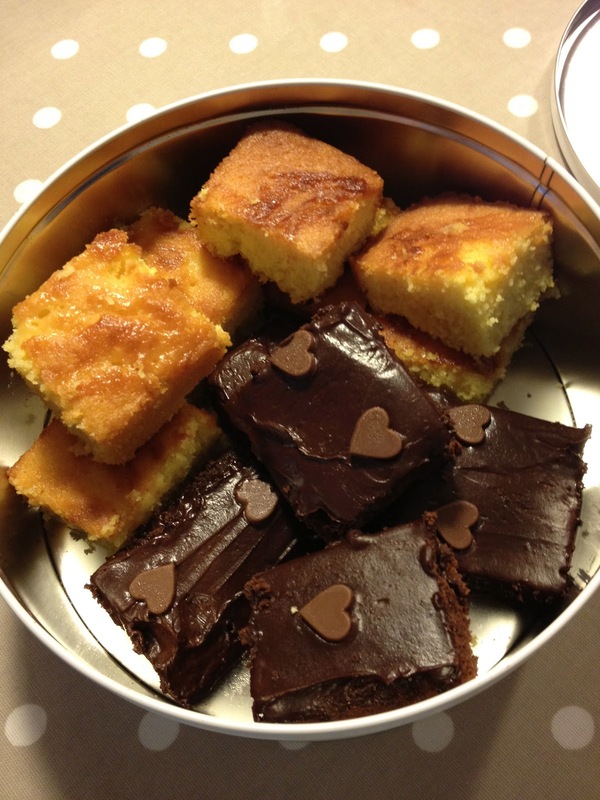 This is all that is left of the weekends baking efforts, a few slices of chocolate fudge cake and some delicious lemon drizzle cake. So here goes with the bread making, with have builders biceps by the time I have finished kneading this. 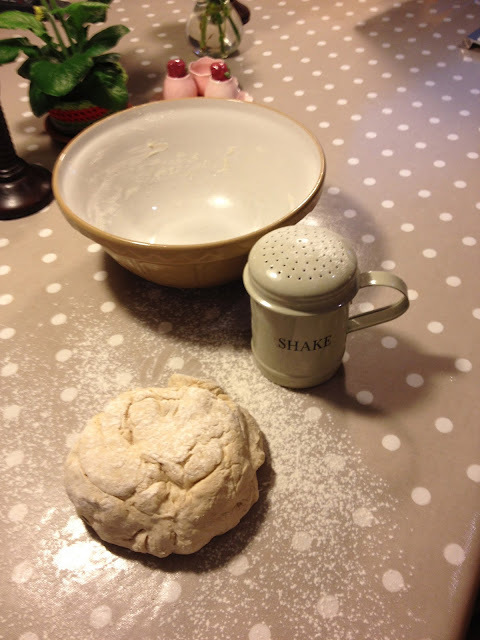 My lovely little flour shaker was a Christmas gift from my son Elias it came from a little shop in Buxton called Atticusboo which is such a little treasure trove of pretty little things. 30 minutes later and here it is all warm and smelling so mouth watering I am finding it very hard not to cut into it and give myself a severe case of heartburn. So onto my next lot of baking for the morning an Almond Tart which is another really quick recipe that everyone loves and again does as just a slice with tea or coffee or for a more substantial pudding adorned with a big gloop of creamy yellow custard or a slick of cream. If you haven't got a greedy household like mine this will keep in a tin for 7 days without going stale. Set the oven to 170c again remember mine is a fan oven so yours may need to be hotter, put in a metal baking sheet to heat up. Line a loose bottomed flan tin with pastry and give the bottom a good pricking with a fork, smear over the jam, I used a lovely bramble jelly that I had made last year. Put in the fridge until you are ready with the filling. 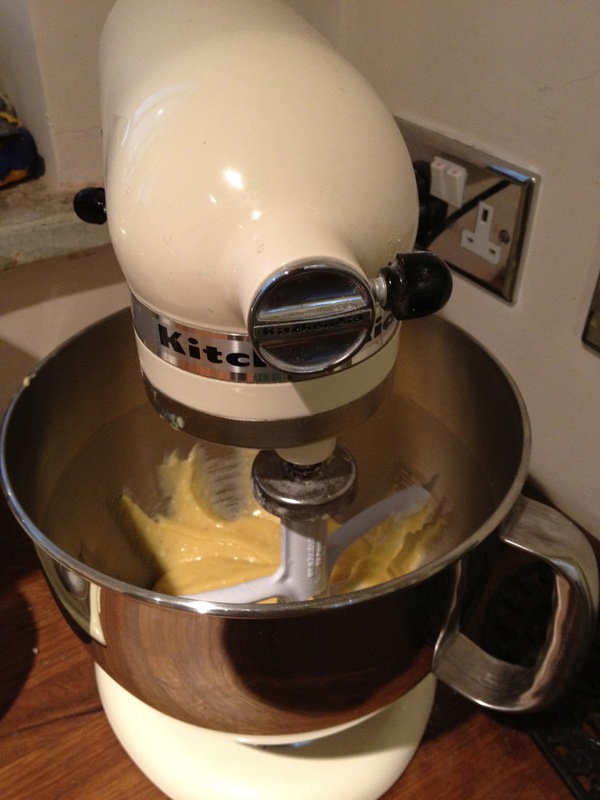 For the filling I just put the butter, sugar, eggs and ground almonds into my KitchenAid and let it do all the work. I am lucky enough to have my own chickens to provide me with the most beautiful deep orange coloured eggs and you can really tell by the colour of the mixture. When it is all well mixed smooth the topping over your jammy pastry case, sprinkle with the flaked almonds and pop into the oven on the pre heated baking sheet for about 40 - 45 minutes. This is really quick and easy, no blind baking to do, but do make sure you put onto the baking sheet as this helps to crisp up and cook the pastry underneath. When I have fresh soft fruits about I sometimes put some blackberries or raspberries on the jam and then cover, this is a real treat but won't keep as long. I cannot tell you how good my kitchen is smelling at this moment in time and I find it such a comforting feeling when the children come home from school and the house is full of the wonderful smells of baking it makes me feel like a real Enid Blyton style Mummy with home baked cakes and tea on the table.